BLast Wednesday Karen Bradley, the British Secretary of State for the north of Ireland, when speaking in Westminster once again insulted the victims of British state violence in Ireland by saying that the state forces responsible for massacres, summary executions, state sponsored assassinations of Irish people, and who organised, armed and directed unionist paramilitary death squads, had not committed crimes, and acted in “dignified and appropriate way”. Her comments caused huge offence and anger to those who have suffered at the hands of state agencies and agents, and outraged all right thinking people. British state violence and injustice in Ireland was not an aberration. It’s never been a case of there being a few rotten apples in the barrel. That cliché doesn’t apply. The politico-military basis of British state policy in the north of Ireland was set out by General Frank Kitson as far back as 1971, in his enduring book on counter insurgency strategy, ‘Low Intensity Operations’. Kitson helped to develop an integrated political, military and legal doctrine that would oversee British operations in Ireland. From the early 1970s that included the use of the internment and torture policy; the recruitment of counter gangs (death squads), within nationalist areas to target republican activists and ordinary civilians; intelligence and psychological operations; and, the deployment of clandestine military units and special forces (such as the SAS), alongside conventional combat troops. 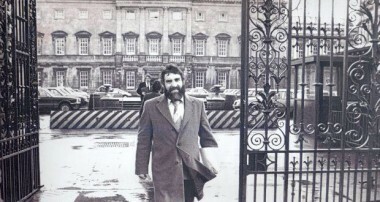 That strategic approach was refreshed and upgraded after the British state introduced the Hillsborough Agreement in 1985 with the Irish government in an effort to promote the SDLP, and push back against the growing electoral and political support for Sinn Féin after the Hunger Strikes. In parallel, British military intelligence and other state agencies began the systematic reorganisation and arming of the unionist paramilitary death squads. Arms shipments from South Africa and elsewhere, were imported and key agents such as Brian Nelson, among others, were placed into controlling positions among the death squads. New shadowy military intelligence agencies such as the Force Research Unit (FRU) were deployed to the north under the command of Brigadier Gordon Kerr. The FRU had a prolific influence in the running of the unionist death squads. The military and security establishment has always been central to the formulation and execution of British state policy towards Ireland. That has never changed. The same powerful sections of the British military and security establishment which directed Britain’s ‘dirty war’ in Ireland continue to exert significant influence in the present. Those who were always hostile to the peace process from within the Military of Defence and security services in Whitehall are still politically and psychologically at war with the Sinn Féin leadership. Their opposition to progressive democratic and peaceful transformation is the reason that legacy issues, and how to deal with the past, is so destabilising within the political process, and indeed is the main factor preventing a new beginning to policing being achieved here. They are responsible for the failure to resolve the legacy impasse because of their determination to conceal the reality of British state collusion, assassination and systematic illegality. According to their zero sum view of the peace and political processes, the British state has too much to lose. For them, legacy represents a new battle ground. So they refuse to acknowledge the role of the state and its forces and agents in the conflict. They seek to promote a single British, pro unionist narrative of what happened. But there is no single narrative. That reality was implicitly accepted in the Stormont House Agreement (SHA) of 2014, and the decision to establish legacy mechanisms for dealing with the past. Since 2014 however, the British government has blocked the implementation of the SHA by invoking its national security veto. The British state, and this particular government, has deepened the legacy impasse by pro-actively encouraging a statute of limitations for British armed forces personnel, and thereby formalising the de facto impunity and immunity which has protected their actions throughout the conflict. This sits in contrast with the fact that up to 20,000 republicans are estimated to have faced prosecutions, and served over 100,000 years in detention since 1969. 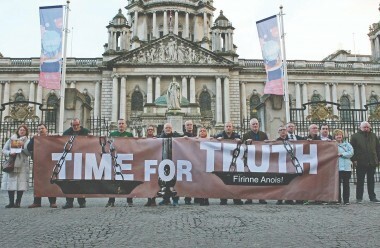 In the meantime, maximum information disclosure, truth and judicial redress continues to be denied to the many victims of hundreds of violent actions by the state and its agents: including the Dublin/Monaghan bombings; the Ballymurphy and Springhill massacres in Belfast; and the executions of, Aidan Mc Anespie, Pat Finucane, and Sinn Féin Councillor Eddie Fullerton; among so many others. All sorts of commentary has surrounded Karen Bradley’s remarks. The vast majority have been highly critical from across a wide spectrum of opinion. 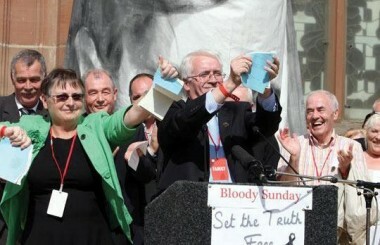 Her statement came in a fortnight when the British Supreme Court ruled that no Article Two compliant investigations had occurred into Pat Finucane’s killing: when the Police Ombudsman revealed a failure by the PSNI to disclose files and intelligence relating to the Ormeau Road Bookies massacre: while the detail of the Ballymurphy massacre by British soldiers continues to be revealed at inquest: and, only days before the Public Prosecution Service announces whether it will prosecute British soldiers responsible for the Bloody Sunday atrocity. Her words were said in response to a DUP MP’s question at a time when this British government is formally allied to the DUP, on Brexit, and to guarantee its political survival. 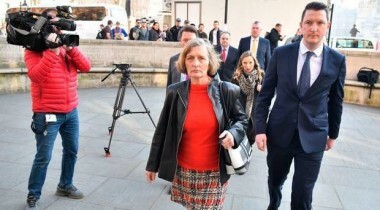 Most significantly, Bradley made these assertions whilst the British government consultation on legacy is extant, and on the same day Theresa May, the British Prime Minister, said she was looking at ways to protect British forces from prosecutions. Theresa May and Karen Bradley have ‘form’ in Westminster as a tag team. Last year they repeated in sequence the lie that legacy investigations processes were disproportionately focused upon state forces. Now it has also emerged that last November Karen Bradley was recorded having an exchange at the Westminster NI Affairs Committee when “getting our soldiers off this hook” was raised. Karen Bradley did not speak out of turn last Wednesday. She was accurately expressing British state policy regarding the conflict in Ireland. 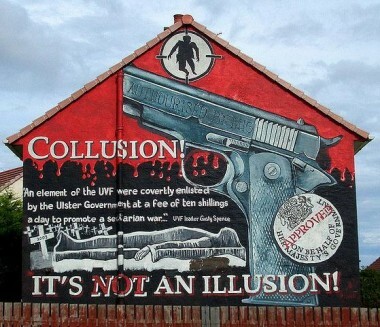 Many other examples stand out, notably, that of British Secretary of State Theresa Villiers who said in February 2016 that the reality of British state forces collusion in running unionist death squads during the conflict was “a pernicious counter narrative”. No British government has ever been neutral in the north. Since it came to power in 2010, this British Tory government has pursued an aggressively, pro-unionist, single narrative policy. It has negatively and deliberately mismanaged the political process in the north. Successive Tory Secretaries of State have presided over waves of austerity and reduced the region to an economic and political backwater. They have consistently acted in the interests of the military and security establishment. Karen Bradley’s latest intervention was indeed absolutely appalling and offensive, but it wasn’t surprising. She was doing her job; and her successors will do exactly the same. Unless and until, the British government changes its pro-unionist and single narrative bias, legacy will continue to destabilise politics and poison the capacity of the PSNI to act in a fully transparent and accountable way, or to command full community confidence. So for progress to be made the British state needs to accept its responsibility as a protagonist in the conflict. This government must comply with the ‘rigorous impartiality’ required under the Good Friday Agreement (GFA) and commit to its full implementation. It has to end its blocking of the SHA and support the immediate establishment of the legacy mechanisms, free from political interference. The attempts to introduce a statute of limitations for state forces must stop, and there should be no change to the definition of a victim. The existing Tory/DUP alliance runs totally counter to the democratic basis of the GFA political process. The Irish government also needs to recognise the gravity of the worsening political situation. It too has major responsibilities. Appeals for apologies from Karen Bradley by An Tánaiste mean nothing to the victims of British state forces and agents, north or south. The Irish government must start to hold the British publicly and politically, robustly to account. It has obligations to ensure implementation of both the GFA and SHA. Failure, and, or unwillingness, by this Irish government to apply the necessary pressure on the British will compound the very deep anger which exists. Resolving these issues, and ending the denial of fundamental democratic rights in the north are the required context to ensure our political institutions can be re-established on a sustainable basis, and build confidence that the British state, and it’s elected governments, are truly committed to the peace process in Ireland – and, not simply on terms which are dictated by the dark side of the British establishment. Níl aon rud eile cíallmhar mar freagra don praiseach is é an Brexit. Tá Sasamach amadach sa céad áit, ach chun sin a thabairt do muintir na Bhreatain gan damáiste a dhéanamh duinn ar an oileán seo, cathfaidh an cúl-stad a bheith sa farraige idir muid. Brexit is madness anyway, since what it’s called and what the majority of those entitled to vote thought it meant, and what it actually meant, are two quite different things. Foolishly, most people leave all of the translation of complex things into simpler concepts to the media; the media are happy to oblige, seeing as how simplification of things is what headlines are about. Though the question asked in the 2016 referendum – “Should the United Kingdom remain a member of the European Union or leave the European Union?” – is quite clear to many, it very obviously wasn’t clear to all. In the same way that after the election there was an upswing in UK voters finding out what the European Union was, it’s only since 2016 that many have realised what “United Kingdom” means. And it doesn’t mean “Great Britain”. Whoops. Offensive though the terms are to right-thinking Irish people, the United Kingdom as written in the referendum question means the United Kingdom of Great Britain and Northern Ireland; that’s what voted to “Brexit”. But the fundamental flaw of Brexit is that Brexit refers to Britain, but Britain was never a member of the EU. Britain is part of the United Kingdom which in turn – along with (under duress) Northern Ireland – is a member of the EU. And some of the United Kingdom voted to remain. A possible majority of Northern Irish voters would prefer not to be part of the United Kingdom, but a definite majority of them voted that they would prefer to remain member of the EU. In short, a majority of people in a province in which a near-majority of people are already unwilling citizens, voted to remain in an entity that a majority of some other people – who didn’t know what they were voting for, but seemingly do know they want to retain and control the unwilling others within another entity – voted should leave, and taking with them people who don’t want to be part of that State and have clearly expressed a desire to be part of something else. (Huh?) If an episode of Yes Minister or Father Ted had such a story line we’d consider it farcically unbelievable. And yet, based on the performance of buffoon Boris, and the ignorance of Bradley, the word farce is often in mind. If Brexit means Brexit, as Mrs May has said, then by all means Britain-exit. But leave Northern Ireland out of the madness. Just because members of the DUP wish to commit financial or some other daft cultural suicide, doesn’t mean that everyone in Ulster is obliged to jump off the ledge with them. The only middle ground that makes any sense is that the cúl-taca, the backstop, applies to the captive counties of Ulster. 2019-01-21: The 100th turning of the sovereign seal of the sovereign Republic of Éire, by Billy Maguire, President of the Irish Republican Brotherhood (IRB), on Ireland’s Independance Day, January 21st, on behalf of the sovereign People of Éire. The sovereign seal of the sovereign Republic of Éire, was the seal of the Irish Republic proclaimed in 1916 and which met for the first time on January 21 1919 following all-island elections in 1918; the seal was present in the Mansion House as a symbol of the Irish Republic that was formally declared independent on that day. This also provided legitimacy to the Soloheadbeg ambush. A member of the Maguire family has turned the seal each January 21st for 100 years; Billy Maguire has carried this out each year since 1963 (56 years) on behalf of the sovereign People of Éire. Uachtarán Shinn Féin Mary Lou McDonald addresses the Sinn Féin commemoration of the Soloheadbeg Ambush 100 years prior; this is generally considered the first act of the Irish War of Independence in which Irish people retaliated for centuries of British oppression. The ambush was organised and carried out by members of the Irish Republican Brotherhood, and Irish Republican Army, and some who were members of both. The objective of the ambush was the capture of explosives used in mining, which explosives were used some months later. It’s worrying that even before the Brexit ink is dry, or even before there’s certainty about that final document being the final, final deal, tá an Fhrainc agus an Gearmáin ag caint faoi Airm na hEoraip. Tá Netherlands ag rá nach bhfuil siad réidh ar bith do sin, ach má an Netherlands sa chómhrá cad faoi Éire? Where are we in this? Should we worry about an EU army? It’s worrying enough to know that the single largest border shift in recent European history is about to happen, and that this is hidden in deep uncertainty. Border shifts are bad at the best of times, but whether one involving England and it’s 3 best enemies (France (enemies for everything before WW1/2), Germany (enemies for WW1/2) and Spain (wants Gibraltar back, always enemies)) can be achieved without some fisticuffs is anyone’s guess; and two of those three are talking about an EU army again. This time there is an outside possibility of the border between them all being up the road. But it’s not like the English could possibly remember that the Germans sent weapons here in 1916, or even that 20,000 French Republicans came in 1796 or that the Spanish Armada dropped by here in 1601; could they? But at least now they’re all part of NATO. So, as long as there isn’t a Russian-selected President in the US, and a super-smart chess-playing ex-KGB guy determined to destabilise NATO in the Kremlin all will be fine. Won’t it? But, all that should matter to us is our island. Caithfaimíd bheith cinnte go mbeidh ár oileán slán. 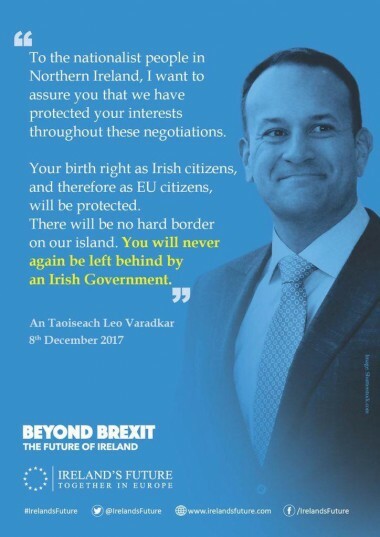 Cé nach bhfuil seans ann go dtiocfaidh sí orainn ró gcásta tar éis Brexit, fós tá seans níos mó as seo amach go mbeidh cogadh arís idir an Bhreatain agus a comharsanna ar an mór-roinn. Caithfimíd siúl géarr a gcoimeád ar áon socrú ag teacht amach as Brexit a bhfuil seans – cé chomh beag an seans sin – go cuirfidh an socrú sinn aon limistéar orainn ag coimeád an oileán slán, nó an bhfarraige timpeall í bheith mar an céad líne cosaint duinn. Say what you like about Mrs Windsor, she does know her long game; very unlike our short-term politicians. While we were happily paying Romans to abuse our generations of embarrassment, the family Windsor quietly did some actual thinking work on how to deal with Theirs. Or rather, She did. And I’m sure it cost Her almost nothing, but thinking. Though few people alive could have done so much of it. And the embarrassment? That’d be us, naturally. She and I are alike, in that we know the long game. Mine not so long as hers, possibly, but sufficiently long to see the pattern of someone seeing a pattern. (I have been tipping away at one project for 42 years, meaning I have an inkling of her compute-power over time). In the game that I believe has just played out, the Irish people voted themselves on the first step back into a United Kingdom, that being of Great Britain and all of Ireland, or something similar. Courtesy of the Diamhasla/blasphemy referendum, and without a shot, She has potentially re-unified the island under Her Authority by pulling the foundation of sovereignty from beneath the ‘Republic’. And the Southern Irish voted their experiment out of existence for it, thinking they were the best little boys in the class. She now just needs to resolve the thornier matter of the relations between that island and this, and may then consider that a little time off for Oneself might be in order. “However, be sure of one thing, that plan is already in motion so there’ll be no need to panic-buy bread or anything else silly”, I hear Her say. And well She might laugh, also. “Higgins keeps Crown”, would be more appropriate, but “Crown keeps Higgins” would probably be more accurate. Now that a corporate entity can Diamhasla, it is now quite safe to challenge in a court that the Irish Free State even has the authority to operate traffic lights. But it’s not all bad. At least She seems to care about this island, definitely more than just getting re-elected! And maybe we should be cognisant of that, considering how little vision or foresight any of our 5-years at a timers have. Even our silly 7-year president couldn’t see far enough either back or forwards in time to observe this mistake around Diamhasla/blasphemy. I guess there’s a good reason why we say “stand on the shoulders of giants” and not of munchkins. You see, I’ve known for a long time that there is no ‘God’. There is a ‘GOD’ and there are lots of gods, and if you want to say “God is Love” then I’m definitely on your side (as long as you don’t mean the duty, endurance, and suffering that passes for Roman ‘Love’. God isn’t just a person, more of a feeling). There’s even a pre-emptive legal defence available to individuals attached inside doors of some homes based on there being no ‘God’. If there is, bring Them to court to explain their position. I’d do the same if the Bunreacht (1937) said all powers derived under Frodo Baggins. “Bring forth the Bagginses”, I’d cry, and watch with amusement the result. For corporate entities, who in this Common Law jurisdiction are treated as persons before the law, it’s not good for us as individuals for them to have such freedom. Think of how few bad guys need to get together to form a Company, and that Company can now proceed with impunity to over-ride the god-provided rights of individuals, happily applying the Bagginses defence as above. The 1916 Proclamation stepped considerately around some of the god/God/GOD complexity, by referring in the end to the “Most High God” and covering a lot of angles at once. Which is good, as the god question is probably the most complex of any, especially since so much of our society is organised around the presumption of belief in one, and precisely one, god. Fiddling with that casually, could be a problem. But if you can Diamhasla without danger (as in “there’s no God, so you don’t get any god-derived rights”) and you’re a corporate entity like a State, you can step all over little people. Now that we can blaspheme, it is now quite safe to challenge in a court that the Irish Free State even has the authority to operate traffic lights. And while you’re thinking about that, compare the description of the national flag above to the flag beside the Ceann Comhairle in Leinster House. What’s different? Toisc go féidir linn Diamhasla anois, agus rá nach bhfuil Sí ann, níl sé soléir an bhfuil ‘cumhacht’ ag an rialtas dul thar an mbóthar can ceadúnas ó tuismitheóir. Freisin, féach cad tá scríofa faoi an bhratach náisiúnta agus déan comparáid idir sin agus an rud atá in aice leis an gCeann Comhairle i dTeach Laighean. Even if one says that without the “under God” part, that there’s still the authority of the people, then that’s the authority of the gang in the Duke of Leinster’s House; surely there is very little during the last two generations that has left us with any faith or trust in them without adult supervision? The only question left, really, is whether someone like a civil servant set a banana skin for us to slip upon 80 years ago when the Bunreacht (1937) was drawn up, or instead is it that we’ve just enthusiastically pull the rug from beneath ourselves by not knowing our own language and the meaning of it’s words? Scenario: A vast foreign tank army (3 tanks would be plenty) lands off a surprise ferry at Dún Laoghaire, closely supported by an overwhelming display of air-power (a single helicopter gunship), and promptly trundles off to the Duke of Leinster’s House. There they roll comfortably atop the security barriers, before one tank batters against a wall with it’s gun, as if it were knocking on the door. Out pops the head of a bewildered Taoiseach. Taoiseach: You can’t do this. Man in tank: We just did. Taoiseach: But we’re a sovereign Nation. Man/tank: No. No you’re not. Man/tank: Says here that sovereignty comes from God. There’s no God. Ergo, you’re not sovereign. T-shock: (wails) You can’t say that. Not when it matters, not that there’s no God. That’s blasphemy! T-even-more-shock: But that’s not what we meant when we voted. Man/tank: There is an undo button in life. Admitting you got it wrong. It doesn’t fix everything. But it won’t fix anything until you use it. There’s a brief pause as the helicopter gunship flies off to eradicate the Irish Army, parked on the M50 in 12 really attractively painted SUVs. Man/tank: Yeah, let me cut you off right there – metaphorically speaking, for now. All those agreements and treaties and what nots depend on there being a God. But even if we cancelled out our God like you cancelled yours – and we haven’t – we still have the mon droit bit from “Dieu et mon droit” to be getting on with. Anyway, in ndeireadh na dála, the above scenario is now possible. Fair play to her. Then again, considering the mess we’ve made of the place, maybe She’s just teaching us that an uninformed citizenry in a democracy are more of a danger to themselves than to anyone else. Then again, it could just be that the real Brexit backstop has become more clearly visible…. It is worth noting, that as a matter of now easily demonstrable fact, that the State currently known as the Republic of Ireland is not the successor to the revolution of 1916, contrary to what is taught in schools. ‘Blasphemy’ has a longer list of things that can be offended than has ‘diamhasla’. The words are not the same. Tá liosta níos faide de na rudaí ar feidir leat ‘blaisféim’ i gcoinne i mBéarla na i nGaeilge. Níl na focail mar an gcéanna. Tá liosta níos faide de na rudaí ar feidir leat ‘blaisféim’ i gcoinne i mBéarla na i nGaeilge. Níl na focail mar an gcéanna. ‘Blasphemy’ has a longer list of things that can be offended than has ‘diamhasla’. The words are not the same.